(Nanowerk News) A fingermark left at a crime scene may now provide investigators with details about a suspect's medications, their diet and even their lifestyle. Thanks to a new technique developed by scientists from Sheffield Hallam University in the UK, the ability to catch a criminal just got a whole lot easier. The technology behind the innovation is MALDI-MSI (matrix-assisted laser desorption/ionisation mass spectrometry imaging). Normally used to chart molecules within tissue, the technology was used for the first time ever by researchers from the university's Biomedical Research Centre (BMRC) in order to analyse and produce images of fingermarks. They discovered that images created through MALDI-MSI not only compared favourably with traditional forensic approaches (e.g. other MSI techniques such as desorption electrospray ionisation (DESI)-MS) but provided a wider range of information on a suspect's details. This includes the ability to detect any substances they might have touched and predict the time that the fingermark was left. 'Based on the results produced so far and the research currently undertaken we can say this technology can help gain much more information from a fingermark than is currently available,' said BMRC's Dr Simona Francese, one of four authors of the paper published in the Rapid Communications in Mass Spectrometry journal. She explained that the technique could help link the suspect to other criminal activity and provide details of their lifestyle by tracing drug use and medication, and even details of the food they eat. 'This is valuable information to a criminal investigation, particularly if the suspect's print is not on the criminal database,' Dr Francese added. 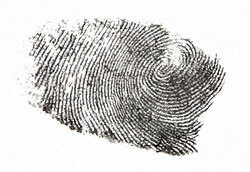 Typically, fingermarks found at a crime scene (often lifted using a powder) are compared with prints on a police database to identify a suspect. The new technique provides the kind of clues that help build a profile and provide important background information in a criminal investigation where there is no back-up record. A fingermark is made up of elements from the surface of the skin and gland secretions that transfer from one surface to another on contact. They are different to fingerprints, where either ink is used or the tip of the finger is scanned. The palms of our hands secrete different material than those on other parts of the body. But because we often make contact with our face and other areas, fingermarks are made up of substances from both sources, especially lipids, fatty acids, amino acids, vitamins and water. Latent marks are those fingermarks made up of transparent materials that are not easy to see (e.g. gland secretions), while fingermarks made up of opaque materials (e.g. blood, dirt and paint) are called patent marks. It is the latent marks, the hardest to identify, that was the subject of the BMRC study. The research conducted by the team also proved that it was possible through MALDI-MSI to re-use the fingermarks even after initial testing. Co-author of the study Dr Rosalind Wolstenholme said: 'Not only does the MALDI-MSI technique allow a greater range of information to be obtained from a fingermark, it also does not affect the fingermark so it can still be analysed by classic forensic approaches afterwards.